• Mobile Ordering: one of the trends in the restaurant industry are using a mobile to order your food. 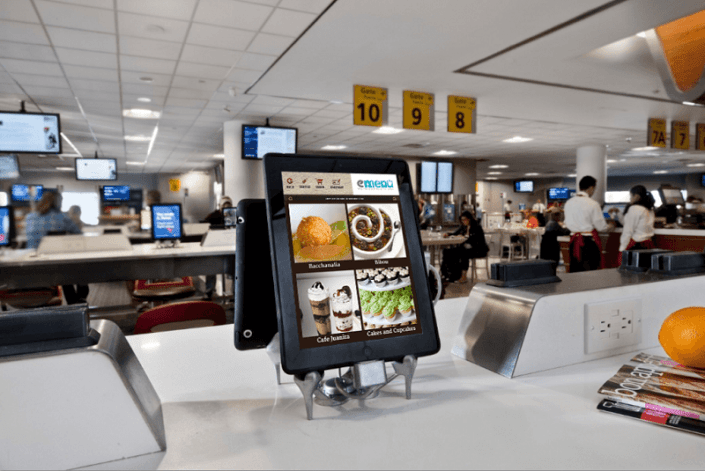 Surveys show that more than 41% will use a self-ordering terminal if available, and customers would rather connect to their mobile app, make their order, and have it delivered or go pick up then to use the old fashioned way. Take a look at these examples to get more info: Starbuck mobile ordering and the Easy Order app. • Digital Menu: many restaurants prefer to use a digital menu, where they can easily update menu items, prices, and pictures and design of course. • Loyalty Programs: of course one of the best ways technology is impacting restaurants is the use of discounts and coupons to attract customers. Most customers prefer to use loyalty programs such as the sum up of points to earn a freebie, or discount coupons to gain more. Loyalty programs have always attracted customers back and will continue to do so. • Restaurant Management: when we say technology is impacting the restaurant business, we don’t just mean the front end. What happens to the management of sales orders, inventory purchases, and finance management? There are many ERP systems or Restaurant Management Systems that will allow the management of your restaurant and will provide the manager with an overview of sales, customers, accounting reports and much more. • Online Reservation: These days there are also many online reservation websites such as Open Table, ResDiary or BookTable that will save your time by allowing you to surf for just the right place and the right time, and reserve your trips. These platforms use an electronic reservation book (ERB) to gather the live info of availability at restaurants and have them ready at your fingertips when and wherever you want to go. • Beautiful Websites: last but not least, restaurant websites are the center of attention with glamorous high quality pictures, simple presentation, responsive layout and informative content. By including info such as your reviews, open hours, picture gallery, you can be sure to attract more customers. Also many tourist websites such as TripAdvisor or Booking.com can show your website to tourists, and you can present your reviews in your very own website. So if you’re a restaurant and you’re not taking advantage of what technology offers today for your business, then think again. You can drive more business with technology, and that’s the bottom point. In our next series, we’ll elaborate more on this industry.